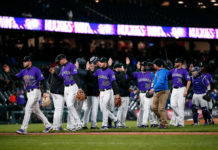 Coming off of a lackluster showing against the Marlins over the weekend, the Rockies will look to turn things around starting on Monday at Wrigley Field against the Chicago Cubs. After batting just .167, driving in just two RBI (one of them from reliever Antonio Senzatela), and striking out 30 times in three games in Miami, the Rockies are going to need a dramatic improvement at the plate if they expect to defeat Chicago. Support the pitching staff: Colorado pitchers held the Marlins to just seven runs all series. If you would have known that before the series began, you might have predicted a sweep. Colorado needs to find that offense that has been so inconsistent for them all season, and it needs to start Monday. Get an early lead: Colorado needs to put up runs early to take off some pressure from their young pitching staff. especially against a very talented roster in the Cubs. The Rockies must give their young starting pitchers an early lead, and with that comes confidence. 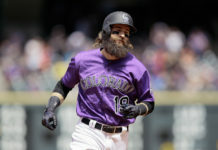 Be aggressive on the base paths: The Rockies could manufacture some runs with a few stolen bases, especially Monday against Jon Lester, who’s known for his inability to throw to first base. He has a history of making horrible errors when making pick-off attempts or even on simple throws to first after fielding the ball. If the Rockies can get on base and get runners in scoring position early, they should have no problem getting after the Cubs in this series. Close it out: Get the ball to Wade Davis. The Rockies spent $52 million on Davis this offseason for a reason. But he’s useless unless the team gets the ball to him in the ninth. Davis currently leads the National League in saves with 10; the Rockies are almost guaranteed a win if they can give Davis a ninth-inning lead. Mash it: After hitting just one home run in Miami, The Rockies need to hit more against the Cubs if they want a chance at the series. Colorado is a team built to keep the lead, and if they can mash some dingers in Chicago and take one, they will have a solid chance of taking at least two out of three from the Cubs. 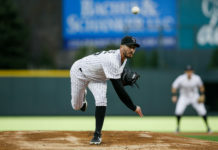 Colorado is on a crucial nine-game road trip and can’t afford to get swept by the Cubs after a disastrous performance against the woeful Marlins. The Rockies need to find out who they are and what they’re made of; will they punch Chicago in the mouth after taking a beating in Miami, or like the Rockies of old, will they lie down and simply look forward to coming home?